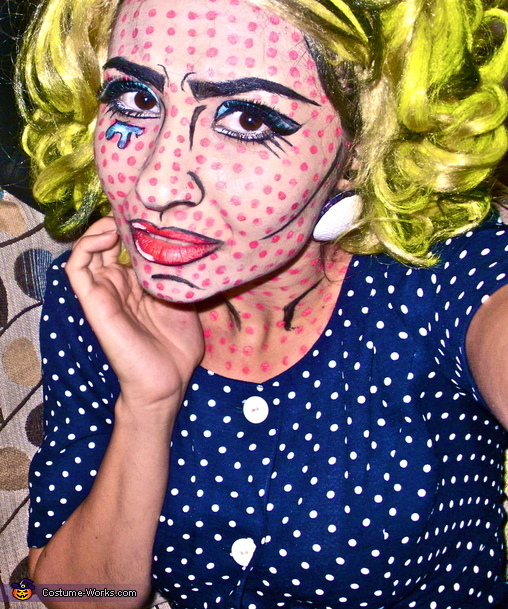 I decided to create this costume after seeing the Roy Lichtenstein exhibit in Chicago. This one is based on the painting "M-Maybe".The makeup took over 3 hours, the wig was painted yellow and black, earrings and gloves were painted and I made a thought bubble to complete the outfit! This is amazing work, good job! hot hot ... too spicyyy..
As for the sign, haha that was somewhat of a challenge. I poked two holes into the cardboard sign, near the bottom, then took 2 white pipecleaners and looped each one several times through each hole. (At this point you have an antennae.) Grab a standard black head band, adjust it to where you want the sign and twist the end of each pipe cleaner several times until they are too short to show. If you want extra support and for the sign to stand up straight, take a plastic flower's stem and tape it on the back of your sign, in the middle, vertically. So now, you have a stick hanging. Because the flower stem has thick wiring, you can wrap that around the headband too. Then take pieces of hair and adjust over the headband to hide the pipecleaners. Voila!